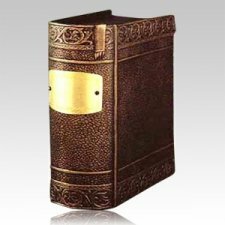 The Closed Book Bronze Cremation Urn is crafted by using the cast bronze technique. The urn is made from solid real bronze. "Having lost my father and my kid's grandfather, being able to quickly and easily find the urns desired (we needed several) and at reasonable price was tremendous. The price, product quality and selection were so much less than at a funeral home. I would definitely recommend Memorials.com Memorial to others during their time of loss." Carol B.